As Jack Sparrow attests, no true buccaneer can be complete without his pirate hat. 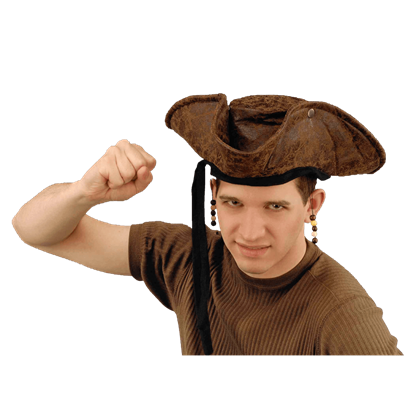 We carry excellent pirate headwear for men, women, and kids. 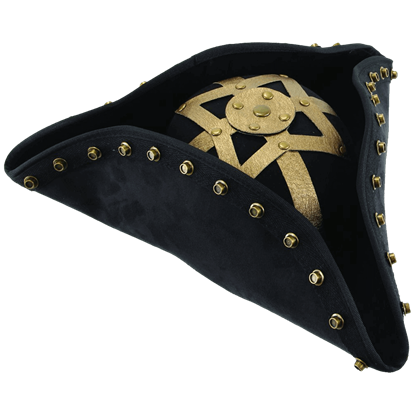 Many of these pirate tricorns and captain hats show off feathered plumes, gold braid, ribbons, and Jolly Rogers in their design, while other leather tricorns possess a more roguish look. 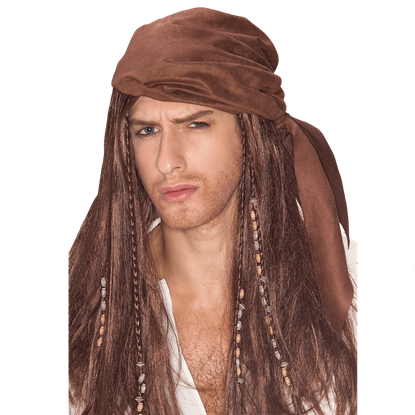 Our pirate wigs and costume hairpieces often extend from headscarves and bandanas, showing off long hair or dreadlocks decorated with beads and braids. Other designs include pirate costume beards, as well. Lady pirates can also appreciate several miniature pirate hats, which go fabulously with pirate costumes. These buccaneer hats come in a wide range of affordable prices, so there is no reason not to finish off your ensemble with privateer flair. Sometimes you forget your razor at home before embarking on your longer voyages. But thats okay. Flaunt the distinction of fully bearded and mustachioed swashbuckler style when you wear the Black Pirate Beard and Moustache. The Black Scallywag Hat is a blocked tricorn hat that has been made the old-fashioned way - by pressing the material around a shaped block. This attention to detail makes the Black Scallywag Hat a great hat for pirates. To arms, men, and show no quarter to these scurvy dogs, or you will be feasting with Davy Jones at the bottom of the sea! 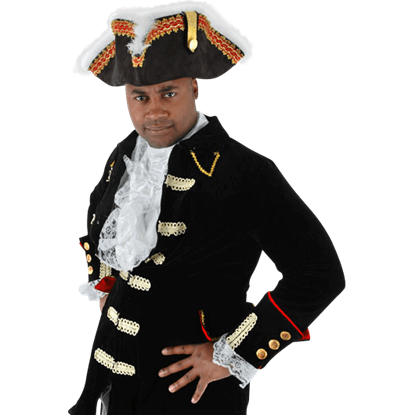 Your crew will toe the line when you stride across the deck wearing this Black Tricorn with Wrap and Locks. It is not hard to imagine a fearsome pirate like Blackbeard favoring an ornate hat. After all, in the old world, even a hat could be viewed as a symbol of status. 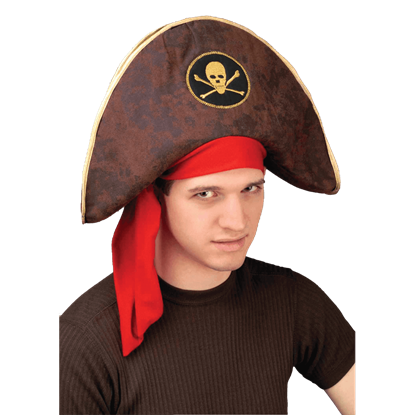 So display your wealth and power by wearing the Blackbeard Pirate Hat. Pirates often have to make difficult choices. Luckily, you do not have to choose between beauty and plunder, because with this Buccaneer Beauty Head Scarf, you can accent your good pirate looks and still get your treasure in the end. Some say that a pirate captains skill and verve can be measured by looking at his hat. If that is the case, than whoever wears this Buccaneer Captains Hat is definitely an impressive pirate captain, by any definition of the word. 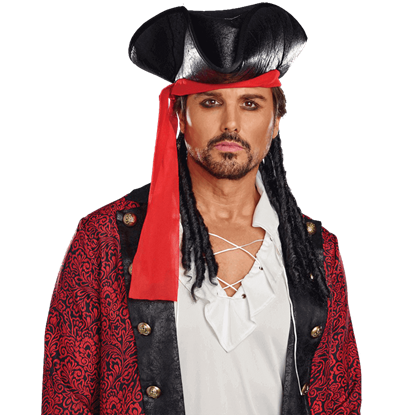 If you find yourself yearning for adventure on the high seas, then the Captain Jack Sparrow Costume Hat is your chance to feel like a true pirate. 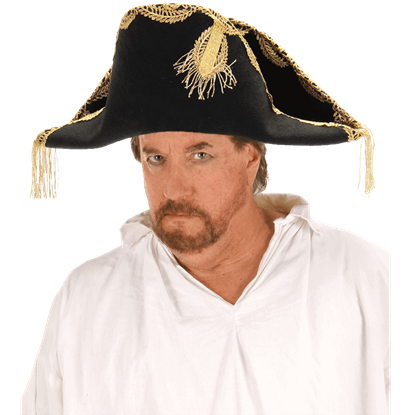 This officially licensed tricorn hat is based on the infamous pirates film appearance. 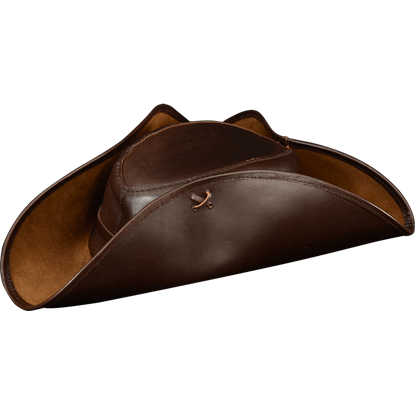 This Tricorn Hat is inspired by the swashbuckling antics of Captain Jack and is for those who still live by the Code. 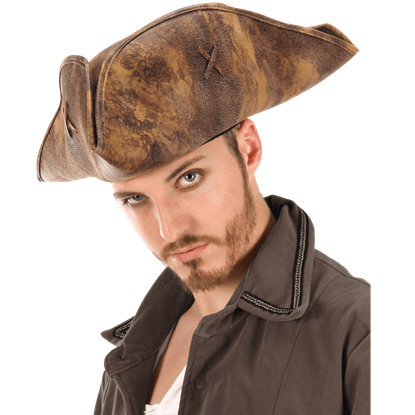 It is made from top grain leather with a weathered dark brown finish and is a must for any pirate. Pirates who sailed the seas found exotic styles while doing so, and many emulated those styles in their personal fashion. 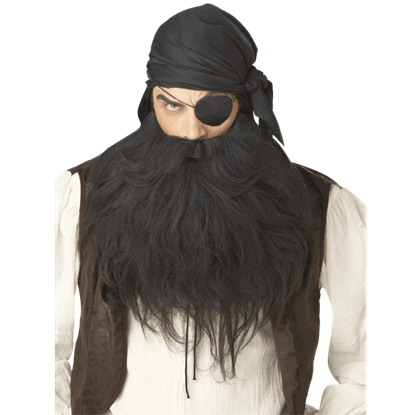 This Caribbean Pirate Captain Wig is a handy accent for any guy to have when creating an exotic pirate ensemble.